The Bocarsly Group has recently focused on semiconductors having a delafossite structure (ABO2) as photocatalysts, particularly those exhibiting Cu(I) in the “A” site. 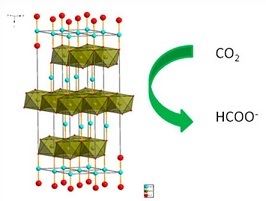 Materials with this crystal structure generally have high p-type conductivity because of the low formation energy of Cu vacancies which are hole producing defects. These materials are less prone to photodegradation than many other p-type semiconductors due to the predominance of trivalent “B” site atom acceptor states in the conduction band, though the small presence Cu 3d character in the conduction band can lead to instability. Mg-doped CuFeO2 (below) was previously studied in the group as a photocathode for CO2 reduction. With a band gap of 1.36 eV and a conduction band edge of –1.1 V vs. SCE at pH 6.8, this material reduces CO2 starting at an underpotential of ~400 mV. At –0.9 V vs. SCE, CO2 is reduced to formate at 10% Faradaic efficiency, with the balance likely contributing to water reduction. Though some Cu(0) is detected after extended electrolysis, it is not responsible for the production of formate. CuRhO2 (below) was also reported as a photocathode for water reduction. CuRhO2 has a band gap of 1.9 eV and a conduction band edge of –1.5 V vs. SCE at pH 14. In 1 M NaOH solution under argon atmosphere, H2 production decreases substantially over time as the material itself reduces to Cu(0). However, this instability is overcome when the solution is saturated with air; the end result is continuous H2 production over a nine-hour period. 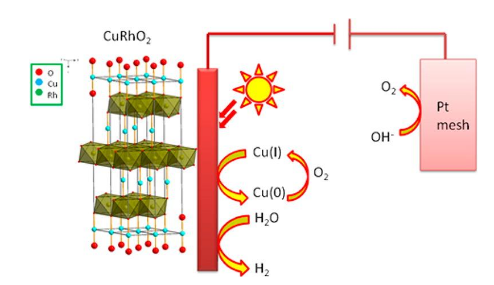 Based on XPS characterization of the electrode after electrolysis, less surface Cu(0) is detected in the presence of air than when the system is maintained under argon. Current work in the Bocarsly Group on delafossite materials includes developing and characterizing new photocatalysts with this crystal structure type. Raebiger, H. et al. Phys. Rev. B. 2007, 76, 045209. Gu, J. et al. J. Phys. Chem. C. 2013, 117. 12415. Gu, J.; Yan, Y. et al. J. Am. Chem. Soc. 2014, 136, 830.